Salt and vinegar potato chips, like any flavor of potato chips, should be eaten only in small quantities due to the relatively high amounts of fat and sodium they contain. Eating too much of salty, greasy snacks like salt and vinegar potato chips can be harmful to your health; try taking out a small portion of the snack rather than eating them straight from the bag to help limit the amount you eat. A 1 oz. 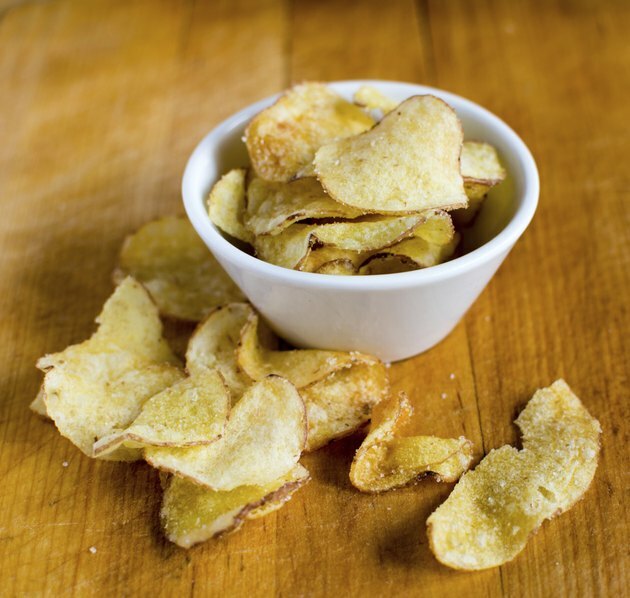 serving of salt and vinegar potato chips contains about 160 calories -- about 17 chips. It also contains 10 g of total fat, which is 15 percent of a typical recommended daily fat intake. It also contains 1 g of saturated fat, which is about 6 percent of a typical recommended daily saturated fat intake. According to the Harvard School of Public Health, consuming too much saturated fat in your diet can increase your risk of heart disease and stroke. The 1 oz. serving of salt and vinegar potato chips contain 230 mg of sodium. That is 10 percent of a typical recommended intake of sodium per day. According to the University of Maryland Medical Center, you need sodium to help maintain a healthy circulatory system, muscular system and nervous system. However, excess sodium intake can increase your risk of high blood pressure and related health complications. There are 15 g of total carbohydrates in each 1 oz. serving of salt and vinegar potato chips -- that is about 5 percent of a typical daily recommended carbohydrates intake. The potato chips also contain 1 g of dietary fiber, which is also about 5 percent of a typical daily recommended intake. They also contain about 2 g of protein -- your body needs protein in order to maintain its muscles, skin, organs and other systems. The salt and vinegar potato chips can provide moderate amounts of several vitamins and minerals; however, you can easily find far richer sources of these nutrients without the potentially harmful levels of fat and sodium found in the potato chips. The chips contain about 6 percent of your daily recommendation for vitamin E; 8 percent of your daily recommendation for vitamin B-6; 4 percent for magnesium, thiamin and niacin; 10 percent for vitamin C; and 2 percent for iron.